For quite some time now our high school English Language Arts teacher has had students do reading logs with metacognition questions. They were required to read for a required amount of time and then asked to write about what they were thinking about. Even if what they were thinking about was not what they were reading. They were asked to write where they got “stuck” on words, sentences, etc. Two years ago, when the students were deeply immersed into this idea I started thinking about what this would look like in math. What is the metacognitive process doing in our minds? For math, I thought this process entailed planning out how to solve a problem, getting the required items to solve this problem, going through the plan and checking the reasonableness of the answer and lastly learning where you are getting stuck so that you can fix misconceptions in order to be successful. 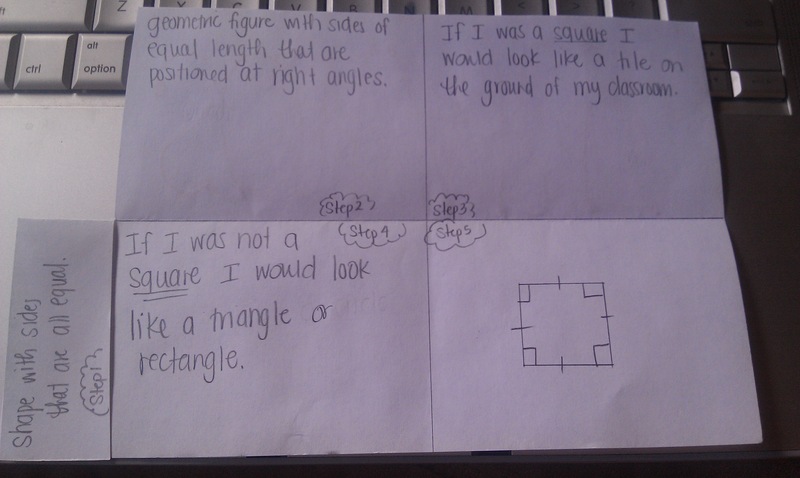 With that said I present to you the Math Metacognition that I have come up with. Two years ago when I first started implementing this I used it as a way for students to get started and I also used it as a way for students to get some points back on their tests. They had to do all 4 Metacog questions for EACH incorrect question on their test. The more detailed the metacognition was (especially #2) the more points back the students received. Note: They couldn’t get all points back to earn an A but they could raise their test score a good amount. I realized that these steps really helped students get started on problems especially when they don’t know how or where to start. Later I figured out that these are the steps I think about in my brain BEFORE I solve any problem. We go through these steps (somewhat) to solve most math problems and to think that students are able to think about this intrinsically is CRAZY! I don’t know how we mathematicians/teachers/good problems solvers learned it but we did it and most of my students aren’t learning it (at least not before they get to me). I forgot about these steps last year but I am bringing them back and plan to really push students to refer to these steps if they get stuck or need help to get started. Below is a breakdown of the reasoning behind each question and the reason for including it based on its importance. 1: The first question is to get the students to re-read the question, look for key words inside the word problem and to pull out that “hook” question that is normally seen at the end of given math problems. The second and third questions are to get student’s brains thinking about how they know they are done with a problem. Most of the time students dive into a problem without even knowing what it will look like when they are done. Then they end up asking me “Am I done?” which I respond “I don’t know, are you?” So I wanted students to start thinking about what their goal is AND WHAT WILL IT LOOK LIKE!?? How will they know they are done with the problem. This then leads into the ability to check if the answer they get, when complete, is even reasonable. This also starts the brain process of estimation which we all know is quite a downfall in most students. 2: These questions were made for students who were looking at problems they had done incorrectly. I sometimes take this question and modify it so they just try to answer where they got stuck. These questions are the ones that you as the teacher can start honing in on where a student is getting their thinking mixed up or where there are misconceptions in their thought process. When we (teachers) can figure out this gap/pothole in student’s thinking we will be able to re-calibrate and get them thinking on the “right track”. We can clear up the misconceptions and get them feeling successful again. 3: This is a typical question you see in most strategies. List all the information you know from the problem. I realized that this should not only be listing stuff they know FROM the problem but instead list stuff they know about the problem because if some kids memorize formulas that would be a good place for them to write down formulas or sentences that they might remember their teacher stating about concepts, etc. This is also for students to realize that they “DON’T KNOW NOTHING” about the problem. 4: Here is their plan of attack. So this again is another of those typical question math teachers see. How are you going to do it? What is your road map? Now because in question 1 they talked about what the answer will look like they are aware of what they are looking for as they are planning their attack. They are also trying to figure out how they are going to manipulate math to “get what they want” (x by itself, area of circle, etc.). Now I do realize that these steps don’t actually ask you to DO the problem and follow through with your plan of attack which is something I am very aware of. If a student is unable to finish a problem but is at least able to do these four steps it is more work than not even trying to attempt the problem. 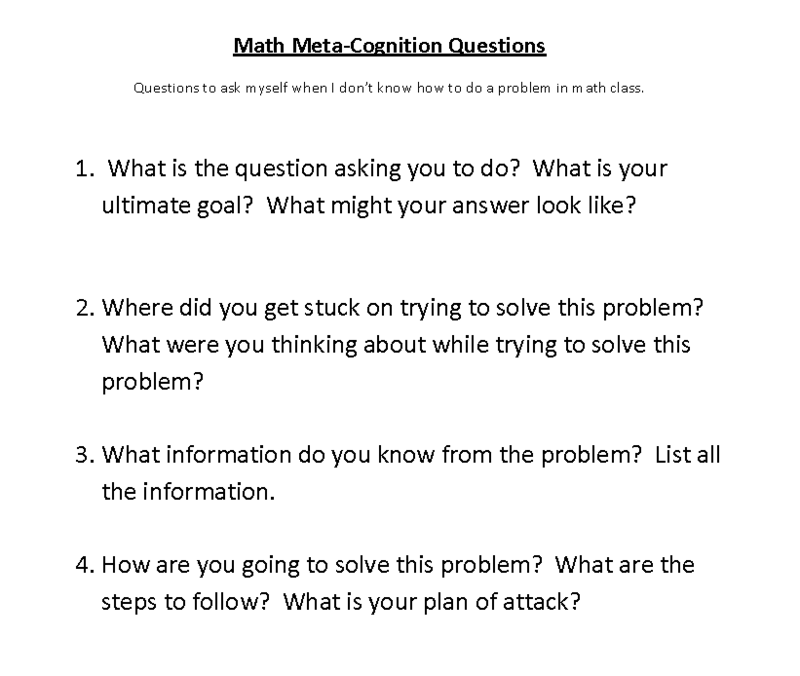 Going through the metacognition is a lot of work and most of the time once students take the time to really think about these questions in order to get started they are most likely than not able to solve the problem. If they are still unable to answer the question then at least they got started by answering the metacog questions. You as a teacher (and the students) are able to see where they get stuck and what they need to work on in order to be successful (question 2). Feel free to use these questions but if you modify them I would love to see because I am sure there are better versions that people are able to make via modification. 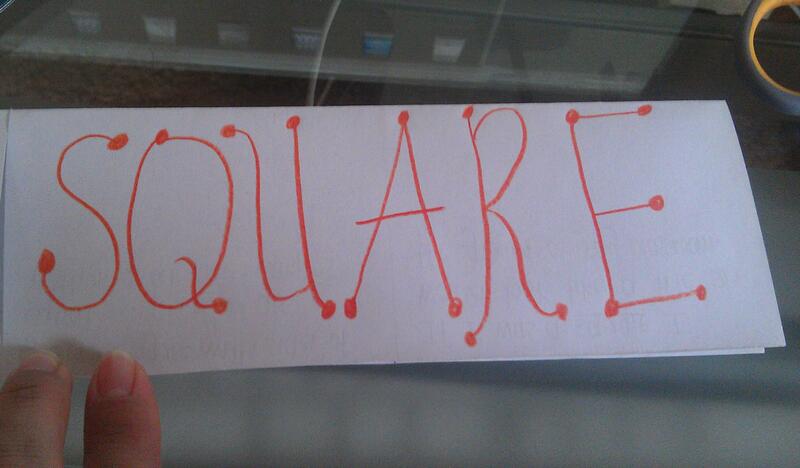 Vocabulary “cards” – My first #Made4Math post! This kick-off of my new blog starts with my first #made4math post. I came up with these 5 steps about 4-5 years ago when I started teaching geometry and realized that i needed my students to have a good way to do vocabulary. I saw this half paper idea from a ridiculous training our school was part of and the only good thing that came out of it was this idea. 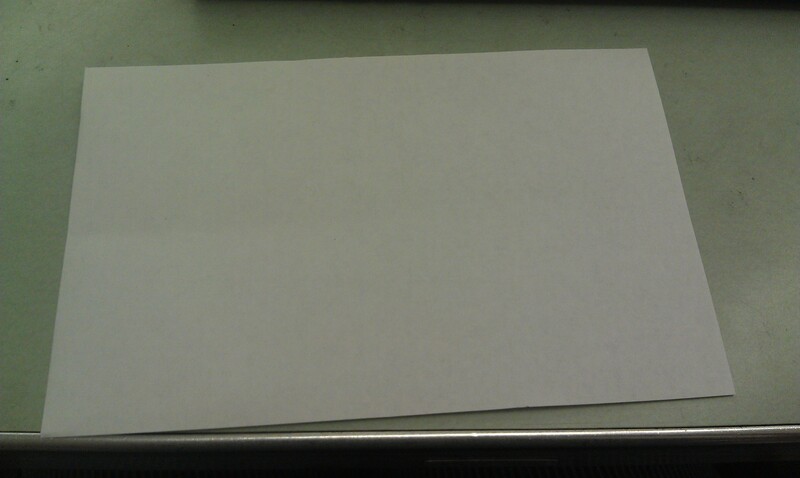 So to start you need a half sheet of paper…. 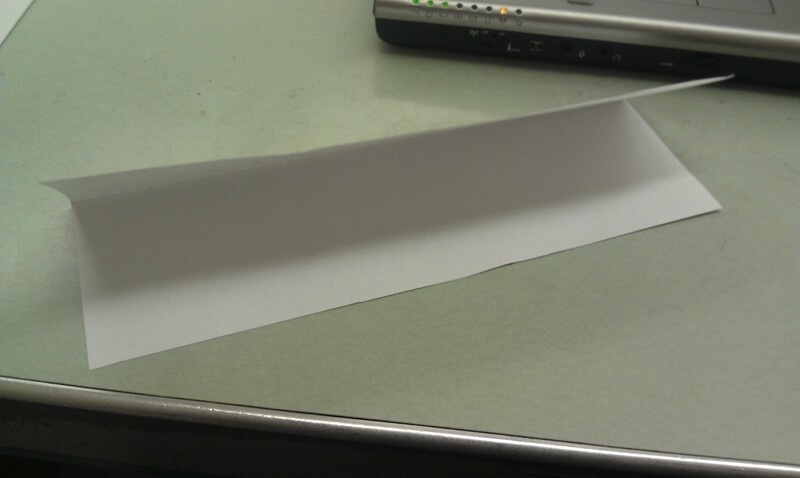 You then have to fold the paper in half horizontally…. 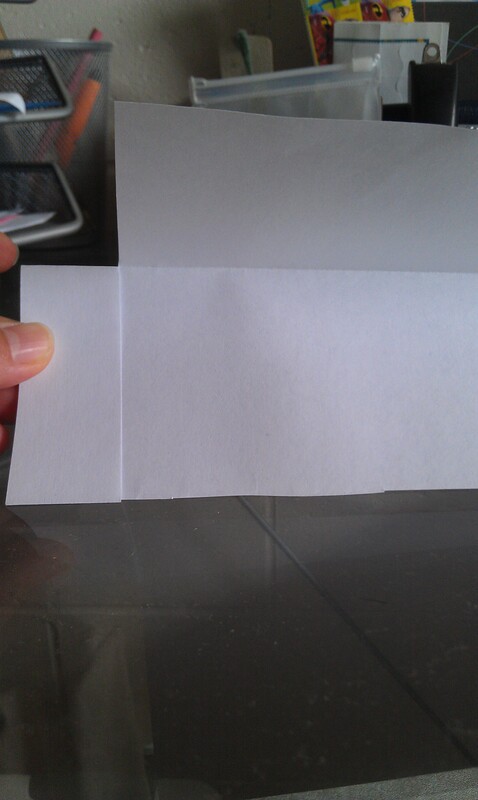 Now you have to cut a little slit on the top sheet…I normally cut mine about 2 inches from the LHS of the sheet…it doesn’t matter what side you cut it but make sure you ONLY CUT THE TOP SHEET!! 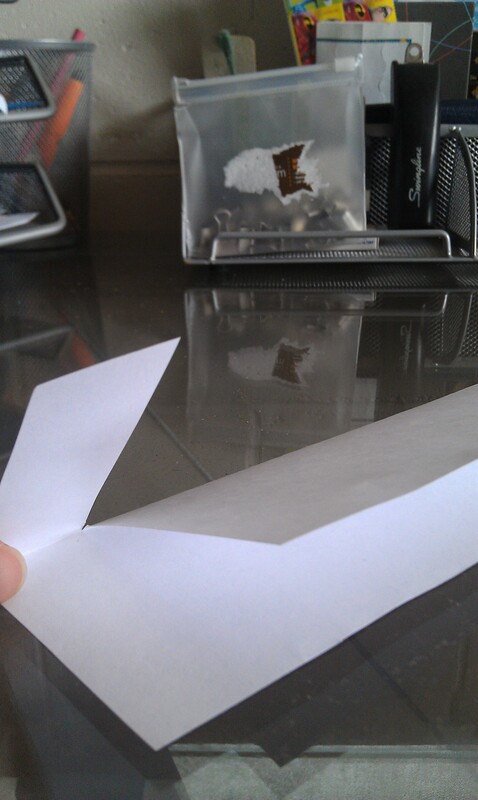 Now you get a piece of paper that when opened up it looks like this…. 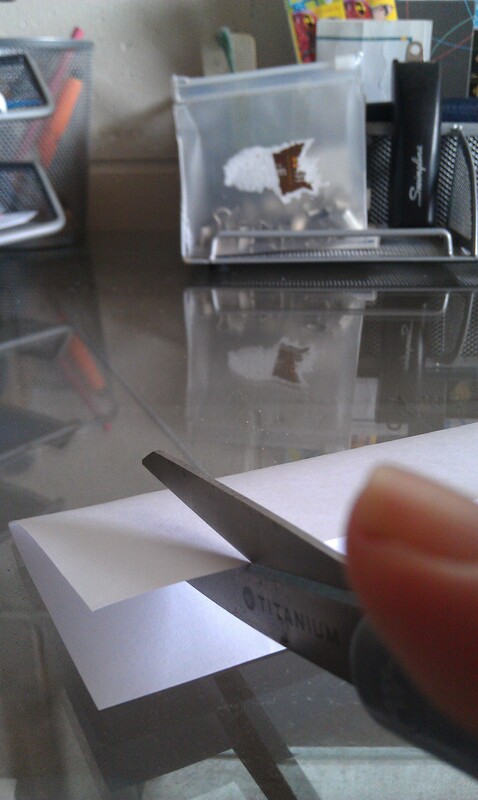 Close the big flap and you will write your vocabulary word on the RHS (bigger piece) of the flap. The small little flap on the left is for Step 1 in the vocabulary word process. 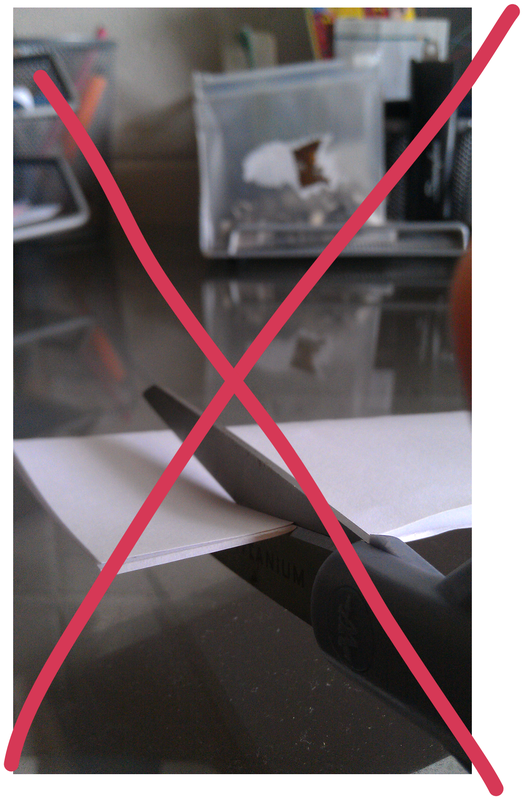 Step 4: If I was not…. 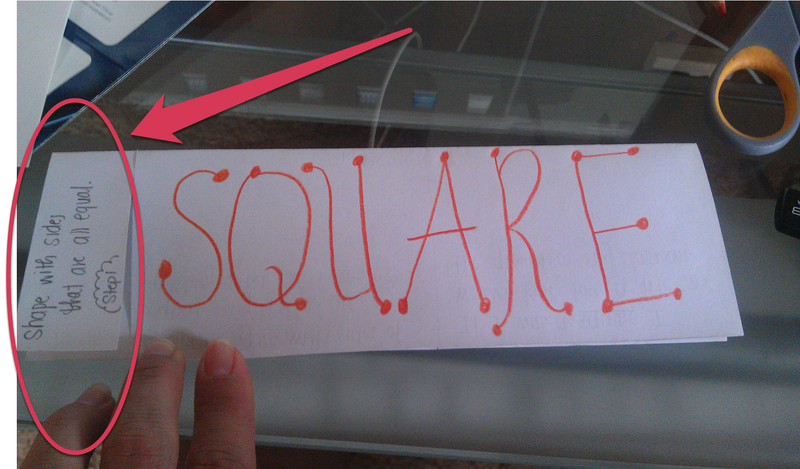 Step 1: I have students do this on the small little flap just to the left of the vocabulary word. This is one of the most important steps because it is like the K of KWL chart. I want them to use the given vocab word to come up with a definition. My example is easy but you can see some misconceptions as you watch students come up with what they think the word means. It is also a good chance to get them to use words INSIDE of the vocabulary word to figure out what it might mean. i.e. Bisector…bi means two, sector means section etc. (you get the idea) Lastly, kids hate to do this step…it might not be a surprise to you but they hate being wrong about something so they don’t want to make a guess and have it be wrong. I try to coax them through this process though because it is important to tap into their previous knowledge. Now comes the inside and the rest of the steps….I have students draw two lines that will cut the inside into quarters…Then they start doing completing Steps 2-5. Step 2: I normally have students use math textbooks (this is what I use textbooks for) to look up the definition of the words I give (I always make sure those words on in there first). But whatever references they use make sure it is what you want them to learn…I wouldn’t recommend using Wikipedia??? Step 3: This is a hard step for those that are just copying down the definition and not thinking about it. This is the step that makes them think about what it means to BE that vocab word. Where do they see it in the real world. What would you look like, act like, be similar to if you were this vocab word. Step 4: This is to drill home Step 3 because in order to know what something is NOT you need to know what something really IS. It is very easy for them to get a little ridiculous here so I try to make sure they come up with something that REALLY shows they know what it is NOT. I don’t want them to write skittles or something ridiculous like that. Note: When I teach I always try to make it personal to students so that is where steps 3 and 4 came from. Sometimes it is hard to come up with a real world example of the vocabulary word so in that case I just have them relate it to something in math. 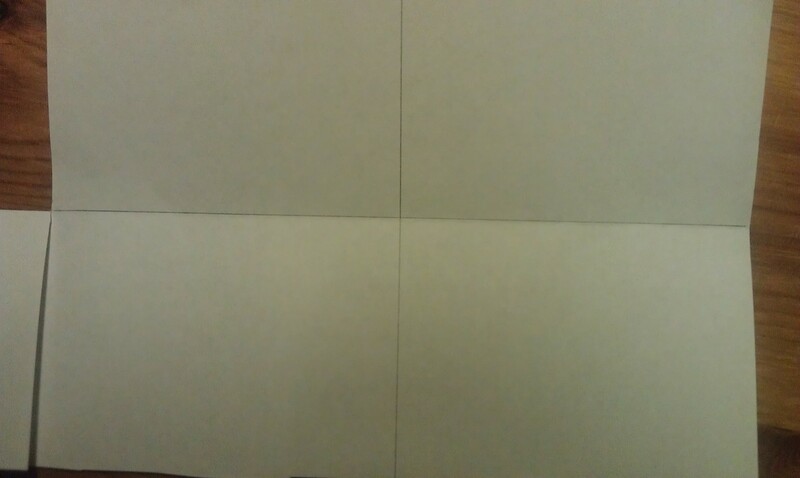 Step 5: This needs be a picture with as little words as possible. Sometimes they point things out and or have numbers. Also, textbooks have pictures in their dictionaries sometimes and kids like to just copy those pictures without even knowing what the picture means so I try to manage that while we are doing this step. I ask them questions if they do end up copying the picture out of the book. Once students are done the next step becomes accumulating these puppies…I have done the hole punch and put them on those lovely little teacher rings that everyone loves…but paper clips work just as well. I was also thinking about making a little pocket in their notebooks for them to put in there (Like Megan’s vocab cards)….If I did this I would still have them put it on paper clip or ring. Lastly, these vocabs “cards” are just a means to get them thinking but it shouldn’t stop here…you have to incorporate them into the rest of what you do daily…refer to them, have them discuss at tables, etc. But just doing the vocab cards doesn’t work, this is just like a note taking device but what matters is the magic us teacher do with it. Please share any ways you have worked your magic with these cards because I am still working on it. ENJOY!